Since 2004, iotum has been building and acquiring a versatile suite of communication tools fit for businesses of all sizes. Its flagship product, FreeConference.com, offers video conferencing, international dialing, call recording, and screen sharing features. In order to better serve its diverse clientele, iotum uses Aircall’s cloud-based phone software because of its simplicity, flexibility, and ability to integrate with Desk.com. Sarah Jezek, iotum’s VP of Sales & Marketing, and Kyle Michaels, Marketing Coordinator, recently outlined how our partnership enables them to consistently impress customers in every corner of the world. 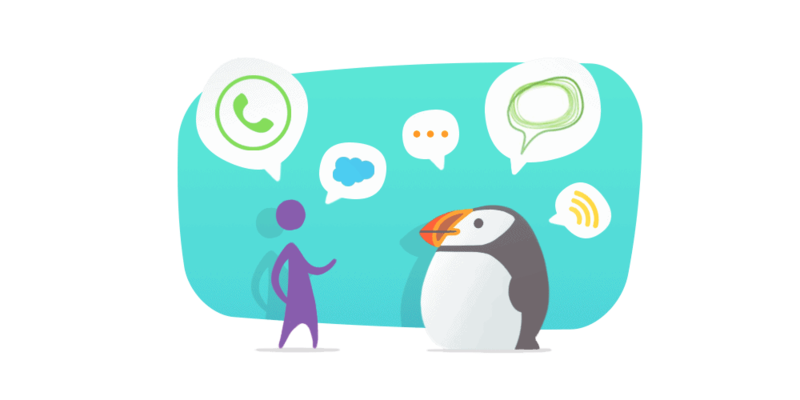 Customer support operations at iotum span multiple continents, but they still need to function as one cohesive unit. Aircall’s versatile phone system offered the ideal solution: an attractive, cloud-based platform with intuitive administrative controls. Managers can easily direct calls between their globally distributed agents so no time zone is left unattended. And with the ability to activate international numbers in a matter of minutes, scaling to new markets doesn’t require a second thought. Iotum’s support team fluctuates between three and eight representatives at any given time, depending on customer activity. Aircall’s flexibility allows for intricate routing rules to be created and altered on a moment’s notice, meaning peak times and slow shifts can have customized, efficient systems in place. Before Aircall fully integrated with Desk.com, iotum used both programs separately. Support tickets were stored and maintained within Desk.com, while phone inquiries were handled entirely through Aircall. Call information and notes had to be manually transferred into the larger database, but the approach worked on-the-whole. When the Aircall – Desk.com integration was finally released, Kyle realized iotum’s productivity could be taken to a whole new level. Calls can now be answered directly within the Desk.com platform, and tickets are automatically created or updated with call information. This welcome change saves support reps’ time and mental energy. Additional context like call tags and call recordings are also saved in appended tickets, helping any agent easily resume ongoing correspondences with a customer. At iodum, the primary beneficiaries of the Aircall-Desk.com integration are support agents. However, it’s common practice to inform the sales team when a ticket presents an opportunity to upsell. With all the information in one place, sales reps can quickly study a ticket and address the customer with confidence. Aircall’s integrations help teams centralize key information, instantly empowering employees with the insights they need to initiate satisfying and successful customer conversations. See the Aircall-Desk.com integration in action.